Today Snow, mainly after 11am. High near 32. North wind 5 to 15 mph, with gusts as high as 20 mph. Chance of precipitation is 90%. Total daytime snow accumulation of around an inch possible. Tonight Snow, mainly before 1am. Low around 17. Northwest wind 10 to 15 mph, with gusts as high as 20 mph. Chance of precipitation is 80%. New snow accumulation of less than a half inch possible. 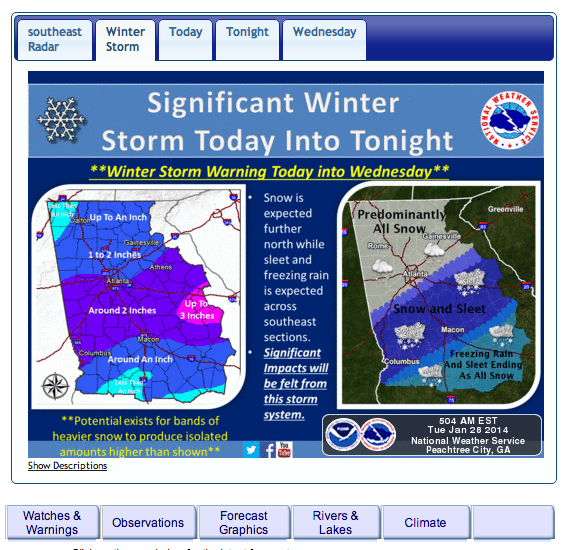 The National Weather Service also has a little history for today: "In 1948, an ice storm that affected states from Arkansas to South Carolina, including Georgia, caused $20 million dollars in damage and resulted in 30 deaths."